Terry Dehdashty travels every year to Nepal. The children in the orphanage are close to her heart. When I asked her about the orphanage, she gushed! This place aims to eventually be a self-sustainable orphanage. We have an eco-farm where we grow organic vegetables. We use the vegetables for the children, and all excess is sold at markets. We have recently acquired two buffalos, and we use their milk for the 25 children that stay at the orphanage. They go to a school within walking distance. Throughout the year they are taken on field trips around Nepal. They get regular medical and dental check-ups. They are very happy and healthy children. The orphanage is not the type of place that most people imagine an orphanage to be in places like Nepal and India. It’s clean and well taken care of. The girls and boys sleep in separate rooms. Here is Terry’s interview with the founder of the orphanage, Bibhu Thaker. What made you want to set up the Eco-Farm & Orphanage? My wife, daughters and I had been supporting other orphanages for ten years. One day a client asked me if I could run a properly developed orphanage. He asked me to find some land and work on building a home. He donated $50,000 to purchase the land. Immediately I registered a not-for-profit organization "Mission Himalaya" and spent almost a year trying to find the right location for the orphanage. Due to very high prices, I could not find anything suitable for 30+ children within the Kathmandu valley, so I decided to explore beyond the valley. I found the perfect piece of land in a village beyond Panauti. A lush green farming valley with no running traffic, no pollution, fresh, crisp air, clean stream water and good fertile soil, and with a good English school. The idea was to develop an environmentally friendly self-sustainable home from which an eco-farm concept was born. We purchased 22,000 sqft and later added another 10,000 Square feet. We will eventually have 50,000 sqft to help us grow more organic vegetables and build a buffalo shed where we will keep two buffaloes for milk and dairy products. Excess produce will be sold in the market to support the home. What is your main line of business? And how does this help the Eco-Farm & Orphanage? My main line of business is adventure and luxury holiday tourism. The people who have helped with the charitable social activities are adventure holiday clients-turned-friends who have helped us with various charitable works in and around the Eco-Farm home. How many children do you take care of? Between 6 and 16 years of age. There is an English school within a 10-minute walking distance. We have six caretakers including a matron, a teacher, a cook, two helpers and a guard/gardener. What do the caretakers do when the children go to school? They clean, cook, wash, iron and help around the house. Once we extend the land, they will help with the vegetable gardens. Later we would like to involve them in a small cottage industry producing farm products such as organic chips, marmalade, jam, etc. for extra income. What is a normal day for the children? 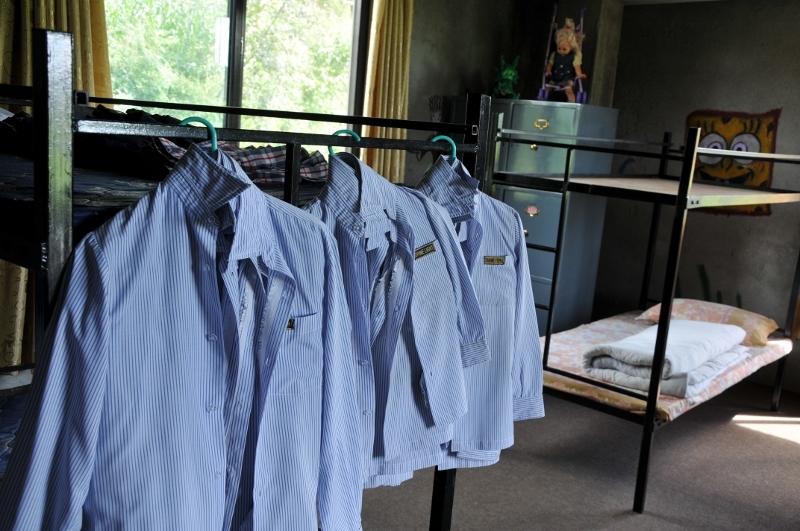 Upon waking, they wash up, have tea and snacks, exercise, do homework, have breakfast and go to school. They return at 4pm and have tea and snacks and enjoy some play time. Afterwards, they do homework and evening study. Dinner will follow and then there will be some time to watch TV before going to bed. What do the children do on weekends? They study, do homework, help clean up the house, play sports, games, and watch TV. What do you grow in the Eco-Farm? Rice, potatoes, corn, onions, spinach, cauliflower, cabbage, tomatoes, beans, some fruits, etc. Where do you get your basic food necessities such as daal, rice, and milk? We buy daal, rice, salt, sugar, masalas, spice, cooking oil, cooking gas, kerosene, and other necessities from the market. We are purchasing two buffaloes for milk and dairy products. Any surplus will be sent to the market with the revenue going straight back to the Eco Farm. Yes. We work closely with Dooley Air-Intermed where retired air-hostesses visit us to teach about health and hygiene. Soon we will develop community support programs to teach the local children about environment-friendly methods, cleanliness, health, hygiene, and more. We also work with individuals who want to volunteer at the Eco Farm. They can clean, cook, help on the farm, teach about cleanliness, health, hygiene, teach English, Maths, Science, and Geography. They can also teach painting, arts, crafts, carpentry, masonry, sewing, embroidery, music, singing, dancing. Volunteers can do sports, martial arts, meditation, yoga, and many other activities with the children. Volunteers are also welcome to help at the medical clinic that we have built nearby. Can volunteers combine visits and sightseeing while they are volunteering at the Eco-Farm & Orphanage? Yes, they can go hiking, trekking, cycling, mountain biking, visit ancient villages and towns and even spend a night or two in one of the nearby mountain resorts. What is your 5-year vision for the Eco-Farm & Orphanage? I would like to extend the land for the Eco-Farm as much as possible within the next two years enabling us to grow rice and more vegetables allowing us to become more self reliant. Also, I plan to develop a separate home for the 60-80+ age group who have been abandoned by their children as Nepal lacks such homes. Bibhu Thakur is the CEO of Himalayan Holidays, the leading adventure and tourism company in Nepal.